Ten stories about Simon Lewis, star of Cassandra Clare's internationally bestselling series The Mortal Instruments, with brand new illustrations. Ten stories with brand new illustrations following the adventures of Simon Lewis, star of the #1 New York Times bestselling series The Mortal Instruments, as he trains to become a Shadowhunter. Simon has been a human and a vampire, but after the events of City of Heavenly Fire left him stripped of his memories, he isn't sure who he is any more. 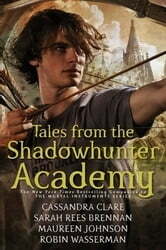 When the Shadowhunter Academy reopens, Simon throws himself into this new world of demon-hunting, determined to find himself again. Whomever this Simon might be... Join him on his journey to become a Shadowhunter, and learn about the Academy’s illustrious history along the way, through guest lecturers such as Jace Herondale, Tessa Gray, and Magnus Bane. These moving and hilarious short stories are perfect for fans who just can’t get enough of the Shadowhunters. The series features characters from Cassandra Clare’s Mortal Instruments, Infernal Devices, Dark Artifices and the upcoming Last Hours series. Brilliant! A must read for Shadowhunter and Downworlder fans. Simon is my favourite character in the Mortal Instrument series so I was in my element when I found out that this book tells of Simon's years at the Shadowhunter Academy. After losing his memory, Simon finds it daunting to live up to his past reputation and tries to prove himself worthy of his hero status. We meet new students studying with Simon as well as visiting guest speakers (from previous books) who tell about their past experiences and offer wise advice. I loved catching up with characters from the Mortal Instrument & Infernal Devices series and finding out what they are doing now and hearing previously unknown recounts from their past. Delightfully entertaining and humorous, and reminds me why I love the world of Shadowhunters and Downworlders so much. I have to keep telling myself that they are not real!